english name "False Coker's Lepidella"
1. Amanita subcokeri, ?? U.S.A.
2. 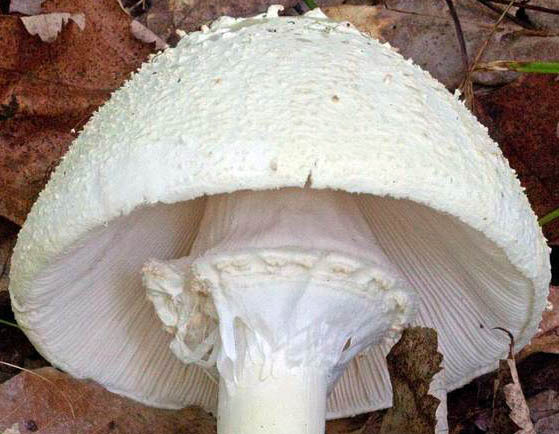 Amanita subcokeri with clearly double partial veil, Jamesburg Twp. Pk., ca. Helmetta, Jamesburg, Middlesex Co., New Jersey, U.S.A.
3. 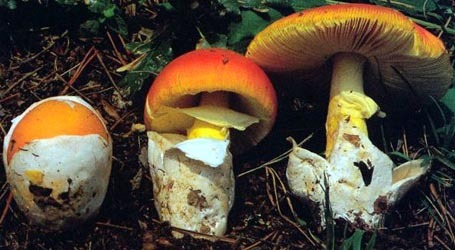 Amanita subcokeri, Bashakill Wildlife Mgmt. Area, Wurtsboro, Sullivan Co., New York, U.S.A.
intro For sometime after the descripton of A. cokeri, this species was confused with it. Fresh material A. subcokeri can be distinguished in the field by its unique odor, its tendency to pinkish staining (especially on the upper bulb), and its tendency to retain its smaller warts on the cap. There is also a distinct difference in spores size and shape between the two species. cap The dry, white, plano-convex cap of Amanita subcokeri is 71 – 137 mm wide, shiny to moderately shiny, and lacks radial grooves around its edge. 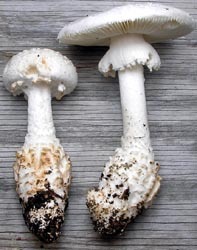 The flesh of the cap is white, 7-15 mm thick above the stem, and thins evenly towards the cap's edge. The edge of the cap is decurved to incurved and sometimes is decorated with a short curtain-like extension of the cap's skin. The volva is present on the cap as pyramidal warts over much of the cap and as small scales or powder near the cap's edge. Remnants of the volva are usually grayish to white to cream, often darkening to brick or brown at the tip. They tend to be especially moveable in wet weather, sometimes sliding off the cap in groups. They are not easily removed when the mushroom is dry. gills The gills are free to very narrowly attached, close to subcrowded to crowded, with color ranging from white to slightly dingy yellowish cream. The can be up to 12 mm broad—wide enough to project below the cap's margin. The plentiful short gills vary considerable in shape—from almost squarely cut-off to staircase-like. stem The stem of A. subcokeri measures 56 - 80 (-130) × 11 - 17.5 (-25) mm and is white, occasionally with brick stains or spots (especially in wounds). 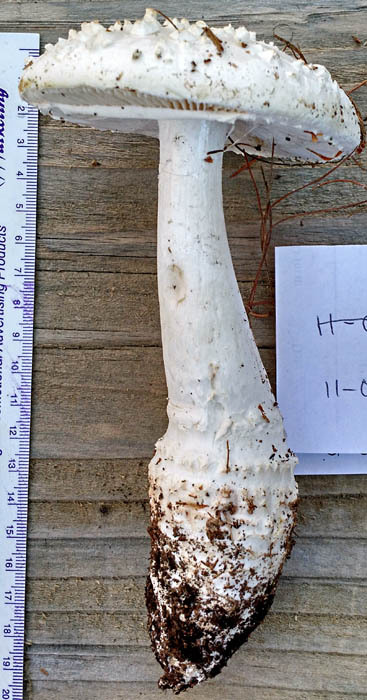 The stem's 42 - 84 × 22.5 - 43 mm bulb carrot- or spindle- or narrowly turnip-shaped and maybe doglegged. The bulb is usually coarsely scaly on the upper part with the scales in up to eight rows; the scaly region often shows red-brown or brick stains or spots The white flesh of the stem is usually solid and exhibits staining like the flesh of the cap. The volva is present in small bita that are firmly attached to the outer edges of the scales; it is also sometimes present as smears on the lower stem or as rings encircling the top of the bulb. The skirt-like ring on the stem can often actually be two rings joined at their free edges. The underside of the single (or combined) ring(s) is attached to the stipe by many fibers in a manner reminiscent to that seen in A. abrupta. odor/taste The odor is similar to a combination of burnt sugar and cedar wood that may be difficult to detect at first, but is stronger when the mushroom is approaching maturity. The odor may become unpleasant with age. Taste has not been reported for A. subcokeri. spores The spores of this species measure (8.0-) 10.5 - 14.3 (-19.0) × (5.2-) 5.9 - 7.5 (-10.9) μm and are amyloid and ellipsoid to elongate to cylindric; clamps can be found at bases of basidia. discussion This species is known from as far north as Massachusetts on the Atlantic Seaboard, as far west as Indiana, and (in the Appalachian Mountains) as far south as Tennessee and South Carolina. 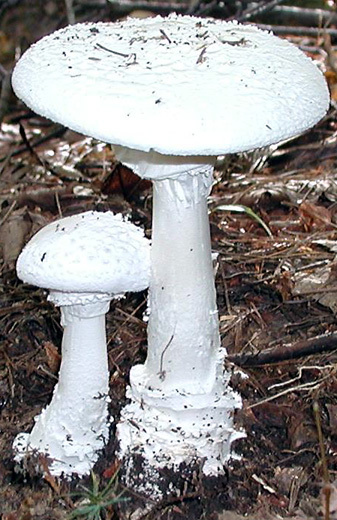 Amanita subcokeri occurs in diverse soil types in mixed forests. Possible symbionts include species of birch (Betula), pine (Pinus), oak (Quercus) and Basswood (Tilia)) as well as Canadian Hemlock (Tsuga canadensis), Shellbark Hickory (Carya laciniosa), and American Beech (Fagus grandifolia). MK277586 nrLSU 24.viii.2007 William Bakaitis s.n. [Tulloss 8-24-07-F] (RET 439-9) L. Nagy, Agaricales Diversification, Szeged Unvi. The following material is based on original research by R. E. Tulloss. pileus 71 - 137 mm wide, white to cream, plano-convex, occasionally with undulate margin, shiny to subshiny, dry; context white, unchanging or becoming watery tan when cut or bruised, 7 - 15 mm thick at stipe, thinning evenly to margin; margin nonstriate, decurved to incurved, sometimes with very short sterile extension of pileipellis beyond context and lamellae, appendiculate with ragged, submembranous, broken curtain; universal veil as pyramidal warts (over disk) to pulverulent coating or minute scales (at margin), grayish to white to cream, darkening to brick or brown at tips, detersile in wet weather, sometimes sliding off of pileipellis as confluent group, quite difficult to remove from dry pileipellis. peridium double click in markup mode to edit. lamellae free to very narrowly adnate, with or without decurrent line on stipe apex, close to subcrowded to crowded, cream to pale cream to off-white in mass, pale cream to slightly sordid yellowish cream to cream to off-white in side view, edge browning in age, otherwise unchanging, rounded at stipe, 9 - 12 mm broad, sometimes extending below pileus margin (side view of basidiome); lamellulae rounded truncate to subtruncate with attenuate tooth to subattenuate to attenuate to stepwise attenuate, almost always alternating with lamellae, but irregularly distributed, of diverse lengths, plentiful. stipe 56 - 80 (-130) × 11 - 17.5 (-25) mm, white, pale buff with age, occasionally with brick stains or spots (especially in wounds), narrowing upward, flaring at apex, faintly longitudinally striate (lens), minutely fibrillose (lens), often becoming satiny in age; bulb 42 - 84 × 22.5 - 43 mm, carrot-shaped to fusiform to subfusiform to subnapiform, radicating, sometimes doglegged, particularly liable to red-brown or brick stains and spots on large scales, upper portion (about one-third) coarsely squamulose with several rows (up to 8 or more) of coarse squared-off recurving scales; context white, solid, occasionally with lacunae up to 30 × 6 mm, changing as in pileus context when cut or bruised, sometimes faintly brick tinted in few minutes after sectioning, larva tunnels in bulb concolorous to brick-red; partial veil white, subapical to superior, membranous, persistent, faintly to strongly striate above, with duplex margin thickened with universal veil material, with fibrils connecting underside and margin to stipe surface, sometimes as true double annulus (lower one superior to submedian) joined at edges or not (when not joined, with lower annulus bearing universal veil on its edge); universal veil on tips of recurved scales on upper portion of bulb or as rings at top of bulb and as smears and flattened incomplete rings on lower stipe. odor/taste Odor like a combination of burnt sugar and cedar wood, strong in maturing material, not unpleasant when fresh, becoming unpleasant with aging. Taste not recorded. 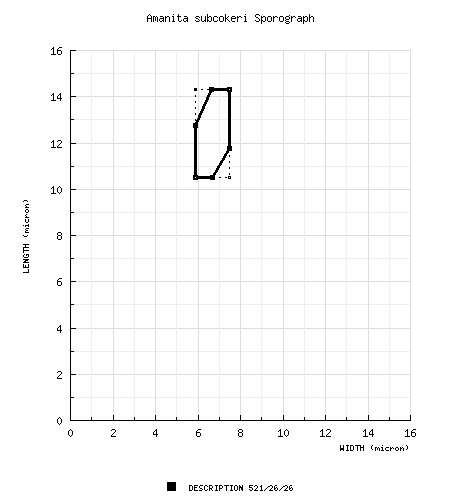 tests L-tyrosine spot test for tyrosinase - positive in context and on surface of stipe (no other tissues tested). Paracresol spot test for tyrosinase - quickly positive in sectioned pileipellis and center of stipe context, within 8 min. strongly positive in disk context, within 20 min. also less strongly positive throughout bulb; negative in other parts of basidiome. Spot test for laccase (syringaldazine) - positive in two small spots near surface just below broadest part of bulb (strong reaction in a wound? ); negative throughout remainder of basidiome. Conc. H2SO4 - pink flash in pileus context; pink flash then dark brown on pileipellis; rapidly pink in stipe context, then slowly fading in < 1 min. to pale pink and colorless in < 4 min. ; rapidly pink on lamella surface, still strongly pink after 3 min., becoming sordid pale pink after 5 min. ; color only in excess reagent after 6 min. Vouchers for chemical tests: Tulloss 7-29-84-B, 7-21-85-C, 9-12-93-A. 7-24-96-L.
lamella trama bilateral, divergent; ??. basidia 50 - 73 × 10.5 - 17.5 (-20) μm, 4-sterigmate, with sterigmata up to 7.0 μm long, arising from ?? ; clamps at least locally common. [521/26/26] (8.0-) 10.5 - 14.3 (-19.0) × (5.2-) 5.9 - 7.5 (-10.9) µm, (L = (10.7-) 10.8 - 13.6 (-13.8) µm; L’ = 12.1 µm; W = (6.0-) 6.1 - 7.0 µm; W’ = 6.6 µm; Q = (1.33-) 1.57 - 2.16 (-2.82); Q = (1.59-) 1.64 - 2.02 (-2.11); Q’ = 1.84), hyaline, colorless, smooth, thin-walled, amyloid, ellipsoid to elongate to cylindric, adaxially flattened or slightly depressed; apiculus sublateral, cylindric; contents ?? ; white in deposit. ecology Solitary to subgregarious. Connecticut: In sandy loam. Massachusetts: In dark brown, unsandy soil, under Tsuga canadensis with Pinus nearby. New Jersey: In sand in pine-oak barrens including P. rigida, Q. marilandica, Q. prinus, and Q. alba. 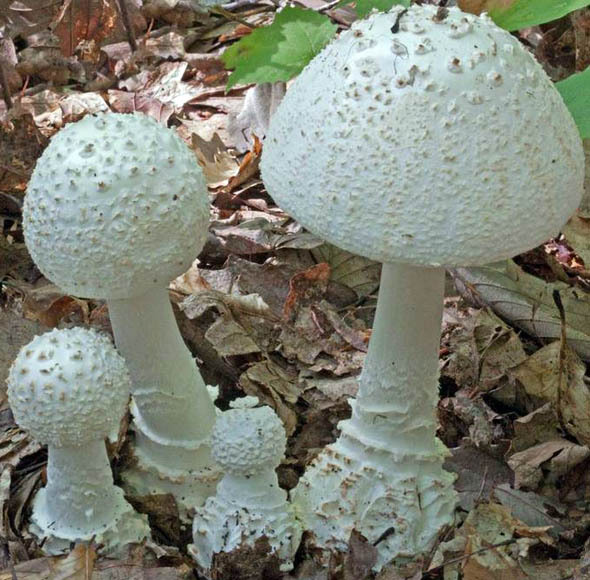 More often than any other Amanita species RET has observed in the New Jersey Pine Barrens, this species is particularly likely to be found with a blue-green Penicilium species growing on the pileus warts or in cavities which may occasionally be found in the stipe context. New York: At ca. 160 m elev. In mixed woods with plentiful Pinus strobus. Tennessee: In forest comprising Acer, Betula, Fagus grandifolia, Liriodendron tulipifera, Pinus, Quercus, Tilia, and Tsuga canadensis or in forest comprising Acer, Betula, Carya laciniosa, Quercus, and T. canadensis. material examined U.S.A.: CONNECTICUT—Middlesex Co. - East Haddam, Devil’s Hopyard St. Pk. [41°28'32" N/ 72°20'25" W, 72 m], 26.viii.1985 R. Phillips 2850 (in herb. R. Phillips; RET 212-5); Salmon River St. For. (South) [41°32’58” N/ 72°27’01” W, 21 m], 24.viii.2007 William Bakaitis s.n. [Tulloss 8-24-07-F] (RET 439-9, nrLSU seq'd. ), 3.ix.2011 Bill Yule s.n. [Tulloss 9-3-11-C] (RET 490-10). Tolland Co. - Salmon River St. For. (East), 31.viii.1997 S. Hopkins s.n. [Tulloss 8-31-97-Q] (RET 267-2). INDIANA—Monroe Co. - SE of Bloomington, Lake Monroe, Paynetown St. Recreation Area [39.0941° N/ 86.4476° W, 174 m], 11.ix.2012 Stephen Russell s.n. [mushroomobserver.org #109447] (RET 535-3); Morgan-Monroe St. For. [39.3298° N/ 86.4388° W, 248 m], 20.ix.2012 S. Russell s.n. [mushroomobserver.org #110638] (RET 535-4). Montgomery Co. - Waveland, Shades St. Pk. [39.9378° N/ 87.0894° W, 223 m], 28.viii.2012 S. Russell s.n. [mushroomobserver.org #107640] (RET 435-9). Owen Co. - Spencer, McCormick’s Creek St. Pk. [39.2982° N/ 86.7217° W, 218 m], 15.viii.2012 S. Russell s.n. [mushroomobserver.org #109803] (RET 535-8). MASSACHUSETTS—Barnstable Co. (Cape Cod) -Brewster, 2.x.2009 Erin Moriarty s.n. (RET 460-9); N. Eastham, 22.ix.1989 Walter Rode s.n. [R. E. Tulloss 9-22-89-WR1] (RET 238-8). Essex Co. - E. W. Palmer St. Pk., 6.4 km W of Ipswich, 12.viii.1985 R. Phillips 2754 (in herb. R. Phillips; RET 212-2). Middlesex Co. - Concord, Walden Pond St. Res., ca. railroad 0.5+ km S of Walden Pond, 18.x.1998 Liz Alia & Einar Rønquist s.n. (RET 289-5). NEW JERSEY—Burlington Co. - Batsto Village, 21.vii.1985 Bart Johnson 7-21-85-C (RET 204-5); ca. Chatsworth, Franklin Parker Preserve 30.x.2009 J. & N. Burghardt s.n. (RET 449-4); north gage ("airport entrance," ca. Chatsworth, Franklin Parker Preserve [39°48.827' N/ 74°32.857' W, 29 m], 3.x.2010 John Burghardt s.n. (RET 468-10), 14.x.2012 Igor Safonov s.n. [Tulloss 10-14-12-K] (RET 519-5). Cape May Co. - Belleplain St. For. [39.2477° N/ 74.8583° W, 8 m], 8.xi.2015 NJMA foray participant s.n. [Tulloss 11-8-15-D] (RET 714-9). Middlesex Co. - Jamesburg Twp., Jamesburg Twp. Pk., ca. Helmetta [40°23’07” N/ 74°25’48” W], 24.vii.1996 Britt Carlson & R. E. Tulloss 7-24-96-L (RET 200-1), 22.viii.1981 M. A. King, D. C., M. H. & R. E. Tulloss 8-22-81-B (RET 322-7), 22.ix.1982 D. C., M. H. & R. E. Tulloss 9-22-82-H (RET 224-10), 19.viii.1981 R. E. Tulloss 8-19-81-C (RET 322-5), -D (RET 322-6), 4.ix.1981 R. E. Tulloss 9-4-81-A (RET 171-7), -D (RET 171-8), 11.iv.1982 R. E. Tulloss 9-11-82-C (RET 177-7), -F (RET 177-8), 3.ix.1983 D. C. & R. E. Tulloss 9-3-83-C (RET 469-3), -D (RET 471-9), 27.ix.1983 R. E. Tulloss 9-27-83-A (RET 227-10), 11.viii.1985 R. E. Tulloss 8-11-85-B (RET 202-3), 21.viii.1993 R. E. Tulloss 8-21-93-H (RET 097-3), 12.ix.1993 R. E. Tulloss 9-12-93-A (RET 104-1). Monmouth Co. - Roosevelt, Goldstein farm prop., ca. Co. Rte. 571 [40°14'04" N/ 74°28'34" W, 41 m], 7.viii.2009 F. Wartchow, Lily & R. E. Tulloss s.n. (RET 457-7; URM). Ocean Co. - Waretown [39°47’12” N/ 74°11’50” W], 1984 C. Hogenbirk 84-1 (RET 132-4). Unkn. Co. - unkn. loc., 18.viii.1984 participant NEMF1984 s.n. [Tulloss 8-18-84-O] (RET 207-4). NEW YORK—Sullivan Co. - Wurtsboro, Bashakill Wildlife Mgmt. Area [41°32’21” N/ 74°31’19” W, 158 m], 25.ix.2010 Steve & Margaret Rock s.n. [Tulloss 9-25-10-A] (RET 484-5). NORTH CAROLINA—Buncombe Co. - Asheville, 2.viii.2010 Patrick Harvey s.n. [mushroomoberver.org #49521] (RET 471-10). Haywood Co. - GSMNP, Palmer Creek Tr., 11.vii.1999 T. Rey s.n. [ATBI FU-0261] (RET 393-9). TENNESSEE—Blount Co. - GSMNP, Finley Cane Tr. trailhead [35°36.7’ N/ 83°44.7’ W], 4.viii.1999 R. E. Tulloss s.n. [ATBI FU-0624] (RET 393-10). Sevier Co. - GSMNP, Greenbrier, 25.ix.2006 R. E. Tulloss s.n. [Tulloss 9-25-06-A] (RET 398-2). WEST VIRGINIA—Greenbrier Co. - woods above rest stop along U.S. Rte. 60 ca. 1.6 km W of Charmco, 9.viii.1990 M. A. Vincent 4381 (MU F38508; RET 146-4). photo RET - (1) ? ?, U.S.A.
(2) ca. Helmetta, Jamesburg Township Park, Jamesburg, Middlesex County, New Jersey, U.S.A.
Steve Rock - (3) Bashakill Wildlife Management Area, Wurtsboro, Sullivan County, New York, U.S.A.
select a collection to review/add spore measurements..#701063. M. A. Vincent, #4381, U.S.A., WEST VIRGINIA, Greenbrier Co., woods abov..#762715. Bart Johnson, #7-21-85-C, U.S.A., NEW JERSEY, Burlington Co., Batsto Vi..#762716. J. & N. Burghardt, #s.n., U.S.A., NEW JERSEY, Burlington Co., ca. Chats..#762717. John Burghardt, #s.n., U.S.A., NEW JERSEY, Burlington Co., north gage#762718. Igor Safonov, #s.n.=>Tulloss 10-14-12-K, U.S.A., NEW JERSEY, Burlington..#762719. Britt Carlson & R. E. Tulloss, #7-24-96-L, U.S.A., NEW JERSEY, Middlese..#762720. M. A. King, D. C., M. H. & R. E. Tulloss, #8-22-81-B, U.S.A., NEW JERSE..#762721. D. C., M. H. & R. E. Tulloss, #9-22-82-H, U.S.A., NEW JERSEY, Middlesex..#762722. R. E. Tulloss, #8-19-81-C, U.S.A., NEW JERSEY, Middlesex Co., Jamesburg..#762723. R. E. Tulloss, #8-19-81-D, U.S.A., NEW JERSEY, Middlesex Co., Jamesburg..#762724. R. E. Tulloss, #9-4-81-A, U.S.A., NEW JERSEY, Middlesex Co., Jamesburg ..#762725. R. E. Tulloss, #9-4-81-D, U.S.A., NEW JERSEY, Middlesex Co., Jamesburg ..#762726. R. E. Tulloss, #9-11-82-C, U.S.A., NEW JERSEY, Middlesex Co., Jamesburg..#762727. R. E. Tulloss, #9-11-82-F, U.S.A., NEW JERSEY, Middlesex Co., Jamesburg..#762728. D. C. & R. E. Tulloss, #9-3-83-C, U.S.A., NEW JERSEY, Middlesex Co., Ja..#762729. D. C. & R. E. Tulloss, #9-3-83-D, U.S.A., NEW JERSEY, Middlesex Co., Ja..#762730. R. E. Tulloss, #9-27-83-A, U.S.A., NEW JERSEY, Middlesex Co., Jamesburg..#762731. R. E. Tulloss, #8-11-85-B, U.S.A., NEW JERSEY, Middlesex Co., Jamesburg..#762732. R. E. Tulloss, #8-21-93-H, U.S.A., NEW JERSEY, Middlesex Co., Jamesburg..#762733. R. E. Tulloss, #9-12-93-A, U.S.A., NEW JERSEY, Middlesex Co., Jamesburg..#762734. F. Wartchow, Lily & R. E. Tulloss, #s.n., U.S.A., NEW JERSEY, Monmouth ..#762735. C. Hogenbirk, #84-1, U.S.A., NEW JERSEY, Ocean Co., Waretown#762736. participant, #NEMF1984 s.n.=>Tulloss 8-18-84-O, U.S.A., NEW JERSEY, Unk..#776842. Stephen Russell, #s.n.=>mushroomobserver.org # 109447#776843. S. Russell, #s.n.=>mushroomobserver.org # 110638#776844. S. Russell, #s.n.=>mushroomobserver.org # 107640#776845. S. Russell, #s.n.=>mushroomobserver.org # 109803#776859. Steve & Margaret Rock, #s.n.=>Tulloss 9-25-10-A, U.S.A., NEW YORK, Sull..#776860. Patrick Harvey, #s.n.=>mushroomoberver.org # 49521#776861. T. Rey, #s.n.=>ATBI FU-0261, U.S.A., NORTH CAROLINA, Haywood Co., Great..#776862. R. E. Tulloss, #s.n.=>ATBI FU-0624, U.S.A., TENNESSEE, Blount Co., Grea..#776863. R. E. Tulloss, #s.n.=>Tulloss 9-25-06-A, U.S.A., TENNESSEE, Sevier Co.,..#776864. M. A. Vincent, #4381, U.S.A., WEST VIRGINIA, Greenbrier Co., woods abov..#776974. Bill Yule, #s.n.=>Tulloss 9-3-11-C, U.S.A., CONNECTICUT, Middlesex Co.,..#786171. R. Phillips, #2850, U.S.A., CONNECTICUT, Middlesex Co., East Haddam, De..#786172. Bill Yule, #s.n.=>Tulloss 9-3-11-C, U.S.A., CONNECTICUT, Middlesex Co.,..#786173. Salmon River St. For., #s.n., U.S.A., CONNECTICUT, Tolland Co., Salmon ..#786174. S. Hopkins, #s.n.=>Tulloss 8-31-97-Q, U.S.A., CONNECTICUT, Tolland Co.,..#830014. Salmon River St. For., #s.n., U.S.A., CONNECTICUT, Middlesex Co., Salmo..#830015. Salmon River St. For., #s.n., U.S.A., CONNECTICUT, Tolland Co., Salmo..#830016. S. Hopkins, #s.n.=>Tulloss 8-31-97-Q, U.S.A., CONNECTICUT, Tolland Co...#830040. R. Phillips, #2850, U.S.A., CONNECTICUT, Middlesex Co., East Haddam, D..#830041. Salmon River St. For., #s.n., U.S.A., CONNECTICUT, Middlesex Co., Salmo..#830042. Bill Yule s.n. , #s.n.=>Tulloss 9-3-11-C, U.S.A., CONNECTICUT, Middles..#830045. Stephen Russell s.n. , #s.n.=>mushroomobserver.org # 109447#830046. S. Russell s.n. , #s.n.=>mushroomobserver.org # 110638#830047. S. Russell s.n. , #s.n.=>mushroomobserver.org # 107640#830048. S. Russell s.n. , #s.n.=>mushroomobserver.org # 109803#830055. John Burghardt, #s.n., U.S.A., NEW JERSEY, Burlington Co., north gage ..#830056. Igor Safonov, #s.n.=>Tulloss 10-14-12-K, U.S.A., NEW JERSEY, Burlingto..#830057. NJMA foray participant, #s.n.=>Tulloss 11-8-15-D, U.S.A., NEW JERSEY, ..#830059. F. Wartchow, Lily & R. E. Tulloss s.n. , #s.n., U.S.A., NEW JERSEY, M..#830060. C. Hogenbirk 84-1 , #s.n., U.S.A., NEW JERSEY, Ocean Co., Waretown#830062. Steve & Margaret Rock, #s.n.=>Tulloss 9-25-10-A, U.S.A., NEW YORK, Sul..#830065. R. E. Tulloss, #s.n.=>ATBI FU-0624, U.S.A., TENNESSEE, Blount Co., Grea..#830068. R. Phillips, #2850, U.S.A., CONNECTICUT, Middlesex Co., East Haddam, D..#830069. William Bakaitis, #s.n.=>Tulloss 8-24-07-F, U.S.A., CONNECTICUT, Middl..#830070. Bill Yule s.n. , #s.n.=>Tulloss 8-24-07-F=>Tulloss 9-3-11-C, U.S.A., C..#830071. Salmon River St. For., #s.n., U.S.A., CONNECTICUT, Tolland Co., Salmo..#830072. S. Hopkins, #s.n.=>Tulloss 8-31-97-Q, U.S.A., CONNECTICUT, Tolland Co...#830073. Stephen Russell s.n. , #s.n.=>mushroomobserver.org # 109447#830074. S. Russell s.n. , #s.n.=>mushroomobserver.org # 110638#830075. S. Russell s.n. , #s.n.=>mushroomobserver.org # 107640#830076. S. Russell s.n. , #s.n.=>mushroomobserver.org # 109803#830077. Erin Moriarty, #s.n., U.S.A., MASSACHUSETTS, Barnstable County#830078. Walter Rode, #s.n.=>R. E. Tulloss 9-22-89-WR1, U.S.A., MASSACHUSETTS, N..#830079. R. Phillips, #2754, U.S.A., MASSACHUSETTS, Essex Co., E. W. Palmer Stat..#830080. Liz Alia & Einar Rønquist, #s.n., U.S.A., MASSACHUSETTS, Middlesex Co...#830081. Bart Johnson 7-21-85-C , #s.n., U.S.A., NEW JERSEY, Burlington Co., Ba..#830082. J. & N. Burghardt s.n. , #s.n., U.S.A., NEW JERSEY, Burlington Co., ca..#830083. John Burghardt, #s.n., U.S.A., NEW JERSEY, Burlington Co., north gage ..#830084. Igor Safonov, #s.n.=>Tulloss 10-14-12-K, U.S.A., NEW JERSEY, Burlingto..#830085. NJMA foray participant, #s.n.=>Tulloss 11-8-15-D, U.S.A., NEW JERSEY, ..#830086. Middlesex Co., #s.n., U.S.A., NEW JERSEY, Cape May Co., Middlesex Cou..#830087. F. Wartchow, Lily & R. E. Tulloss s.n. , #s.n., U.S.A., NEW JERSEY, M..#830088. C. Hogenbirk 84-1 , #s.n., U.S.A., NEW JERSEY, Ocean Co., Waretown#830089. participant, #NEMF1984 s.n.=>Tulloss 8-18-84-O, U.S.A., NEW JERSEY, Un..#830090. Steve & Margaret Rock, #s.n.=>Tulloss 9-25-10-A, U.S.A., NEW YORK, Sul..#830091. Patrick Harvey s.n. , #s.n.=>mushroomoberver.org # 49521#830092. T. Rey, #s.n.=>ATBI FU-0261, U.S.A., NORTH CAROLINA, Haywood Co., Great..#830093. R. E. Tulloss, #s.n.=>ATBI FU-0624, U.S.A., TENNESSEE, Blount Co., Grea..#830094. R. E. Tulloss s.n. , #s.n.=>Tulloss 9-25-06-A, U.S.A., TENNESSEE, Sevi..#830095. M. A. Vincent 4381 , #s.n., U.S.A., WEST VIRGINIA, Greenbrier Co., woo..